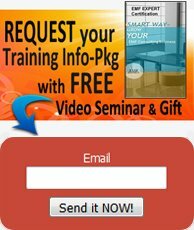 "Introduction to Consultant Certification Training" is our free online presentation designed to give you all the info you need to know to become an in-demand EMF Consultant specializing in EMF Detection and Protection - this free online presentation enables prospective certification trainees like you to take a good look under the hood and get your questions answered - what income could you expect? What are the client prospects? What does the future hold for you as an EMF consultant locally, nationally and worldwide? And much more. Attending the presentation also gives you an opportunity to take the online learning platform for a test drive, get a feel for your instructor, and find out if life as a Certified Professional EMF Consultant is for you. AND by attending the free presentation you earn a $500. Gift Certificate to be used towards upcoming training if you chose to proceed. No pressure, ever. First, RESERVE YOUR DATE in the Events Calendar for any free presentation. Yes, you will receive a $500 Discount towards the cost of the next certification training course, automatically at the conclusion of this interesting, one-hour presentation. Need More Info to Get You Started? OUR CERTIFIED EMF PROFESSIONAL TRAINING OPENS DOORS! 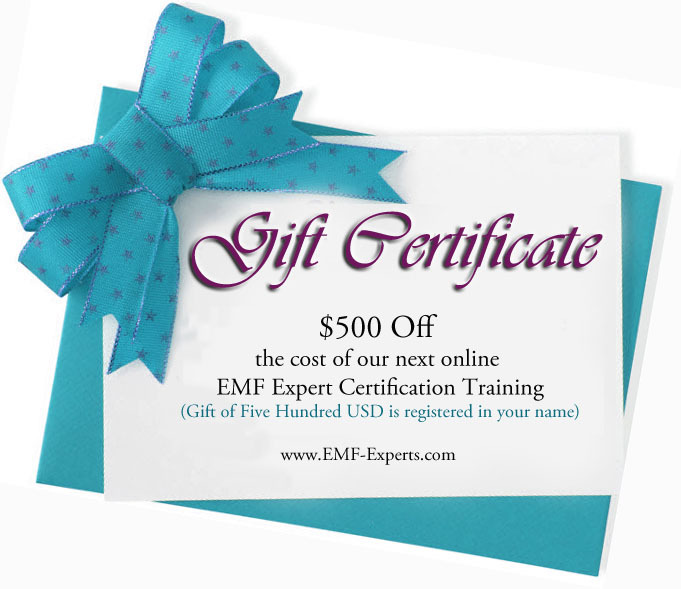 EMF Training Certification - What can EMF Expert Certification do for you? Find out the many areas of the EMF Consulting industry this training can lead to, and discover some of the many businesses that have successfully added on a new income stream as a EMF Expert Consultant to their existing services. Outstanding EMF Consultant Training - Discover the high standard of excellence and features that distinguish this EMF Certification training, and what distinct and valuable advantages these features give graduates. 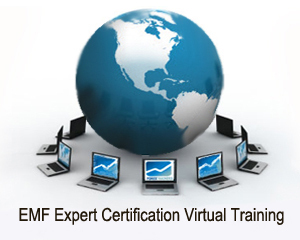 Certification EMF Training Topics - What can you expect your certification training to include? This EMF professional training outline will give you the topics that are covered in both virtual and seminar training. EMF Experts and Professional Directory gives our graduates worldwide exposure and excellent online marketing and promotional business support right from the start; your lifetime "Certified EMF Expert" directory membership is included in the certification training. Ready to Get Started Right Now? - Enthusiastic about getting certified for your new career today? Read the list of certification course descriptions and find the one that is best for you. Then look for it on the calendar of upcoming certified training courses, and register for the training of your choice (training registration requires no financial info). "Awesome certification training! I hit the ground running (with confidence) the day I finished the course, and my business has been built from the ground up based on the tried and true methods of a true EMF Professional that would have been far beyond me without this training." "Electrosmog can be more dangerous to you than you think. I was electronically stalked by a cellphone hacker, Chris returned my SOS message within the hour and walked me step by step through how to protect myself right away. I went on to take his excellent training to learn how to protect myself from the many other risks of electronic pollution - I never realized how insidious EMF is!" The Bedroom Sanctuary ebook guided me through everything I needed to know to finally eliminate and block the various sources of EMF in my bedroom causing my sleep disorders. Ah, to sleep perchance to dream - blissfully at last." "This Certification Training is simply the best there is. 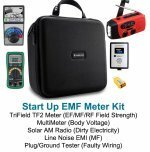 I thought I would learn how to wave an EMF meter around and that training would be very American based, and instead I learned more professionally valuable, global-in-scope, and life-saving info than I ever imagined. I say 'life saving' because my wife, who took the training with me, is convinced this training saved her life. Three words of advice: Take this training!" "EMF Expert Certified Consultants are easy to locate in the Directory, and to me a well trained consultant who's advice you can trust is vital in an area where so much contradictory information and outright misinformation abounds on the internet". "What would I do without my Certified EMF Consultant? She helped me locate my new home, and now I don't buy any new technology without at least a phone consultation with her first."